To find a licensed wildlife rehabilitator in your area, click here. If you need the services of a wildlife rehabilitator in the Chicago area, visit Flint Creek Wildlife Rehabilitation at 847-842-8000 or Willowbrook Wildlife Center at 630-942-6200. During the spring and early summer, many baby birds called "fledglings" are discovered. A fledgling is a young bird that has all its feathers, is almost ready to leave the nest, and has crash-landed during its first flight or has been pushed out by its siblings. Too often, well meaning folks will find these fledglings and pick them up, bringing them to a wildlife rehabilitator to raise. The importance of returning a healthy baby bird to its parents to be raised can't be over-emphasized. If you find a fledgling, fully feathered, with other adult birds making a lot of noise around him, give him a cursory check to see if he has any visible injuries. Birds don't have a keen sense of smell so it's safe to touch the fledgling. Look for blood around its beak, closed or unfocused eyes, rips or tears to its skin, or obvious broken bones. Check to see if it's breathing normally. A bird generally breathes fast, but it should not appear labored. If, after your exam, the bird appears uninjured, it should be returned, or left in the area where it was found. Place the fledgling in bushes as high as possible or in the nest if you can locate it. You should move away and see if the parents come back. They should find the bird and will almost certainly feed it. If you don't see other birds approaching right away, keep watching and make sure that you can't be seen. If it's getting to be nightfall, you may want to put the fledgling in a box to keep it safe from predators overnight. Place it out again in the morning. Keep checking, and should it truly be abandoned, then call a licensed rehabilitator. If you have found that the fledgling has injuries, call a wildlife rehabilitator. Do not give anything by mouth until you are told to do so. Birds can aspirate liquids into their lungs very easily so extreme care must be exercised. Keep the fledgling in a covered box on soft cloths. Keep it warm, but out of direct sunlight and drafts. Transport to the rehabilitator using care not to have the air conditioning in the car on too high, if at all. Chilling will cause further damage to an already compromised bird. Should you find a baby bird without feathers, try to locate the nest and put the bird back in. If you have disturbed a nest of baby birds, and you do not want the nest where it is you have some alternatives. Put the nest with the baby birds in it into a strawberry/fruit basket and attach it close to where it was, but out of your way. The parents should come back to take care of their young. If you find a nest and can wait two to three weeks before disturbing it, the babies should fledge and then you can remove the nest from your way. They've been around for 70 million years, They don't have a "permanent" home, instead they hang around for two or three days, eat what you have to offer, and go on their merry way. They are referred to as "Nature's Sanitation Engineers." What am I writing about? Opossums. With tolerance and understanding humans can co-exist with opossums , which are a benefit to any home they visit, Unlike other wild animals, opossums are resistant to many diseases, including rabies. They are very clean and constantly groom themselves. They are non-aggressive and will not attack humans. You know those garden pests -- slugs and snails? The opossum has them for appetizers. He then goes on to cockroaches, crickets, and beetles to name a few other insects he finds a delicacy. Main course? Mice and rats or carrion, And dessert? Overripe fruit, or food discarded by man. The opossum is nocturnal and transient, however, he may return to your place after some weeks away depending on your hospitality. Besides their natural predators, opossums have to deal with humans, cars, and cats. Very few survive to adulthood and those that do live for only one to two years. Opossums may growl, drool, and show their 50 teeth when frightened, but in reality are placid and prefer to avoid any confrontation. When an incident is unavoidable, "playing possum" is one of the most effective ways they defend themselves. When unable to flee, extreme fear places opossums in an involuntary coma. They become stiff and their mouths will gape open, a condition that can last 40 minutes to 4 hours. Most predators will abandon their attack when faced with a 'dead' opossum. Babies are born in the spring and average eight to a litter. 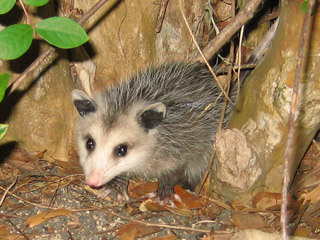 Opossums are North America's only native marsupial (mammals with a pouch), and like baby kangaroos, opossum babies stay inside the mothers' pouch to nurse and develop. After 2-112 months the babies leave the pouch and ride around on their mothers' backs. At 4-1/2 months (or when they measure approximately 7 inches not counting their tail) opossum babies are able to tend for themselves. The orphan opossums you find result when the mother is frightened and takes flight The babies fall off and cannot survive on their own- Opossum babies are very cute, white with dark ears and eyes, and even when young, the opossum knows to hiss and show its teeth when frightened. Baby opossums require very specialized care if they are going to survive and should be turned over to an experienced care-giver as soon as possible. Information obtained from the Opossum Society of the United States. What homeowner hasn't found his garbage cans overturned many a morning and garbage strewn around? Neighborhood kids playing a prank? FBI checking up on you? No, to both. Chances are you have been visited by a "masked bandit "--also known as a raccoon. The name raccoon is from the Algonquin Indian language and translates to "he scratches with his hands". Raccoons call the continental US home, and they are most comfortable near ponds, the CTA train tracks, the Canal or heavily forested areas where they have access to water. They have tactile hands, long, sharp nails, and a very inquisitive nature. Considering that most of their area has been turned into small communities of humans, it's amazing that they have adapted as well as they have. Raccoons are mammals that eat meat and vegetable matter. Some of their favorite foodstuffs are the meadow mouse and crayfish. In the spring they eat more animal matter like insects, snails, frogs, worms, young fish, birds, and mammals since these items are abundant. In the summer and fall they consume more carbohydrates--corn, acorns, fruits and berries. If you feed your dog or cat outside your are probably feeding the raccoons too. Many area residents are delighted to see a mom and kits joining their cat at a nightly supper. They can be "trained" to come around the same time every evening for snacks. Raccoons can grow to be a foot tall (at the shoulder) and weigh 20-30 pounds. While they will flee when faced by an enemy, they are strong enough and tenacious enough to stand and fight especially if there are babies (kits) involved. They mate mid-winter and give birth in early spring to between three and six kits with the average being four. Kits are completely dependent upon their mother for their first 16 weeks, after which they are fairly independent. They stay with their mom a little less than a year to learn the finer points of fishing for crayfish, and hunting for mice and snails, along with how to open those pesky garbage cans. Raccoons are den animals who will look for a dark enclosed area to have their babies. If you have a hole in your roof or soffit where they can get into your attic, they will. Once they have set up housekeeping you have two options. First, wait until the family grows up and moves out, then repair the area they got in through. Your second option is to make them want to move. Place a bright light in their area, play loud music day and night and they might decide you are not the kind of neighbor they want to have. Mom will pick up each kit and move it to an alternate den. A parent should never be trapped and removed from her kits as the kits will die. It's better to delay trapping until the kits are able to take care of themselves or trap in the early spring before they are born. Every rehabilitator has tales of bringing up a raccoon kit. Kits consume as much time as a human infant, needing to be fed, burped, and put down for naps. When they get older they get into everything. (Stories abound of how two kits got into paint and handprinted everything in site including the living room couch). They can empty cabinets and open boxes in only a few minutes. They love to climb into and onto everything, only to get mad when stopped and removed. Raccoon adults and kits can be exposed to, and die from distemper, a disease common to dogs and cats. 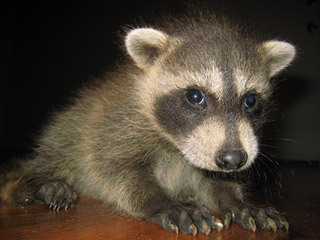 Caution should be taken if you have un-vaccinated dogs or cats in your household and you find raccoon babies. Rabies, which is different from distemper, is transmittable to humans through a bite from an infected animal, but is not a threat in this immediate area at this time. You should always be cautious of any nocturnal animal around during the day light hours (especially if it's a masked bandit in your trash can.) By the way, if your garbage can has holes chewed in it it's probably squirrels, but more on that next issue.